Sowas Von Egal, is the result of a collaboration between Bureau B and the Hamburg party series Damaged Goods. Record companies and DJs are aligned through a love and passion for seeking out rare music which simply needs to be heard. For the three of us as DJs, we created Damaged Goods as a party where we could play music beyond the electro clichés. Our focus would be seldom-heard post-punk and synth-wave from, or in the style of, the 1980s. We’d slip in these unknown or long-forgotten treasures between more familiar hits from the genre to inspire and excite our guests. Eighties culture is very much a reference point today in music, art and fashion, so why not play the originals, especially as there is still so much to be discovered from that period? Many of the old records we’d play in the club had only been pressed in small quantities, often sold exclusively at the respective bands’ gigs. More than 30 years later, it is almost impossible to get hold of these tracks, unless you pay over the odds on certain websites or track them down as inferior MP3s on this or that blog. 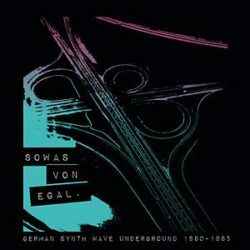 This is why it was so important to us that our collaboration with Bureau B would be dedicated to selecting tracks for Sowas Von Egalwhich are not readily available on vinyl and have not been rereleased (or the reissues themselves are genuine rarities). The groundwork for this project was interesting in itself: sorting through and listening to songs, making lists, setting priorities, then getting in touch with labels and trying to find the musicians of yesteryear. This wasn’t always so easy: some had disappeared from view, others had died. When we did find who we were looking for, the reaction was generally positive, although some were surprised that anybody was interested in their music today. We would also like to express our deepest gratitude to Tom Morgenstern, who worked wonders with a jumble of disparate source material to achieve sonic consistency. Fans of our parties will recognize more than a few of the tracks on Sowas von egal; we are proud to have put together this collection.